This is the first ukulele I ever purchased while on my first trip to Hawaii. I bought it at the flea market in Honolulu, and I confess, as more of a novelty than anything else. I couldn’t leave without a ukulele! I paid about $15 for it and as musical instruments go it was probably not worth it. Being very new to the ukulele world, I struggled to tune the ukulele while learning the sound of the tuning I was not yet familiar with (I played guitar previously, so was a bit befuddled by this strange new ‘slack string’ tuning). This ukulele cannot be tuned and will not hold a tune for anything. One dramatic attempt to tune it ended in a violent snap as the tightness of the strings ripped the neck right off the body. This was startling to say the least and convinced me I should get a real ukulele. 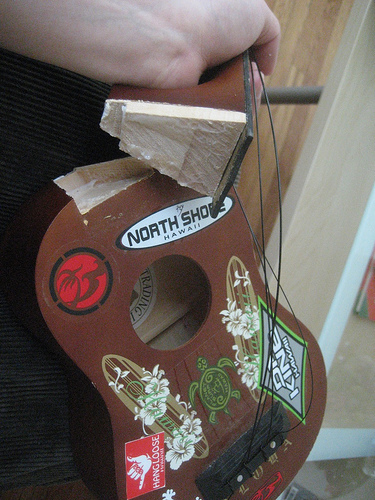 The ukulele seems to be made of wood, but it really seems to me more like really dense cardboard. I think it is actually some sort of particle board. The fretboard is painted wood with metal inlays (I didn’t get the lowest of the flea market bunch. I did have some standards at the time). The keys actually seem to be pretty good quality plastic. They seem sturdy and when the first attempts to hold a tune failed miserably, they were easily tightened to hold on a bit better. On the other end the bridge is made of plastic and looks to be merely glued in the same fashion the rock steady neck was casually squirted with a few drops of wood glue and slapped on. It however has not budged a bit, unlike the neck. The body has taken a beating and has chipped and scratched very easily. 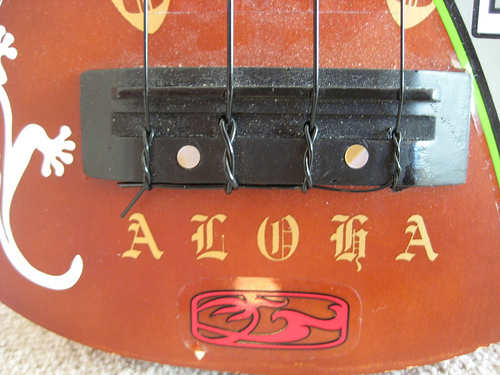 The front of the body was printed with a surfboard and flower pattern and the word ‘Hawaii’ written in curly font. Below the bridge the word ‘Aloha’ is printed. 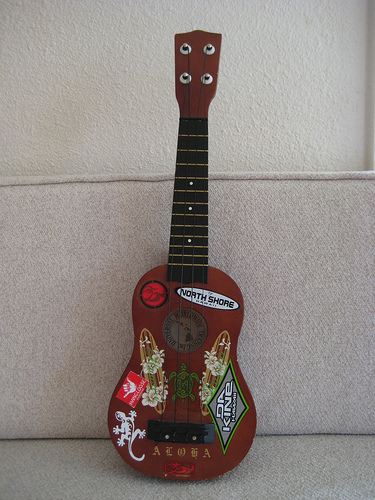 This was the ‘coolest design’ of the cheap ukuleles I could find. As for the sound of the thing, I never could really tell since I could never get it tuned. But judging from the tinny sound of the mal-tuned strings it would not be pleasant. All in all it is a bad ukulele. But it has 3 redeeming qualities for myself. 1) it was purchased on my first trip the land of paradise 2) It is adorned with many stickers I collected on said trip 3) It still holds some sand from the beaches of Oahu. Therefore it holds great sentimental value and that is why I still own it today. Buy one at the Universal Worldwide Trading Website. I have a UWTC and it’s my first uke. It was given to me as a gift, almost as a joke. I have the blue model with a picture of Diamond Head on it and it came in a flimsy triangular cardboard box. I’m not a stringed instrument person so I don’t know how to be picky. I know that the bridges and friction tuners are made of cheap white plastic and that the body has strips of cardboard caulking up the seams. It has a pretty paint job, which is why I have noticed twins to my uke screwed to the wall for decor at Hawaiian-themed restaurants. The friction tuners are a pain and the higher strings have a tendency to loosen themselves even after I tighten the screws on the back. The plastic on one tuning peg stripped out after a while. I don’t think I’ll be able to easily replace it because it’s in a 3/8″ hole and the replacements I’ve seen use 1/4″ holes. The wood strip that the strings are tied to at the bottom is also starting to pull off the body. THAT BEING SAID, I have had a *LOT* of fun with this instrument. Maybe because it’s small and portable, maybe because it looks like a kiddie toy so no one expects me to play it for them, but I really love it. I play it from 5 minutes to 2 hours a day depending on how much time and stress I have. The strings (still using the originals) stay in tune after a while. I’m too tone-deaf to notice any problems with fret placement. The sound is very quiet and tinny compared to ukes at my local music shop, but that’s fine for my purposes since I’m super self-conscious and I don’t like people to hear me play. While the build quality is very low, it did stand up to a lot of abuse (including 2 moves in a college town) before it finally bit the dust. I’m planning on upgrading to a uke with geared tuners soon. I have one of these. In fact it’s the only ukulele that I own and it cost me only about $40 because everything is overpriced in Hawaii. I have had it for a little over a month now and within that time have managed to successfully learn three songs that sound rather decent, at least that’s what I’m told by those I meet. I agree with the other when they say that it is rather difficult to keep it tuned. I have found that I need to re-tune it about every 3hrs or after playing it casually for about an hour. Other than the tuning problem I really haven’t noticed any other issues. Sure the finish on it chips away if it’s banged around a bit but I find that it’s no reason to detract from buying it. As for the make-up of the uke (ie. woods, strings, nut, etc.) I can’t really say much. The only major complaint I would have about it is that the nut once came loose but that was easily fixed with a quick super-glueing. Would I take it to an actual performance? No, I wouldn’t but I would definetly take it around to a party or just casually because it works, it’s cheap, and if it comes untuned nobody expects a grand performance so it’s ok. I bought this ukulele in Hawaii for about $27 as a present to my little sister. I tuned it once when it was first opened, and it seemed sturdy. But as time passed, the pegs got loose and it was nearly impossible to make a descent sound. 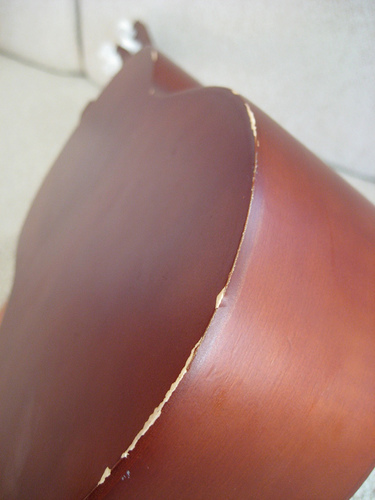 Once they were fixed, I was uneasy about re-tuning due to the possibility it would break the neck completely off the uke. We kept it as a keepsake, but will no longer try to force a tuning, and bought a less stressful one to replace it. I bought my uke at the Aloha Stadium flea market, where the kind merchant attempted to teach me three chords- I paid $30. It has a wood top, with just a screen print of Hawaii on it. On the same day, I went to another merchant in the market who taught me more and played his beautiful koa uke (way out of my $ range), and lastly, we bought a uke lesson book from a third stall (music and books) and a CD of great Hawaiian music. Great fun in paradise! My hubby bought a cute tiny painted uke from vendor for a mear $2! his doesn’t stay in tune and is probably plastic. But it’s cute and a good memory! My ukelele actually stays in tune pretty well for a tourist instrument. I’ve strummed on it when I needed a break from the acoustic guitar (just learning!) and have successfully learned Over the Rainbow and other songs! I’m yearning for a pretty, solid, uke with abelone-purfling and a good sound. But, for now, this meets the need for a little sound of paradise. I got mine for $5 at the goodwill. Being that its strung and can make music, I can’t complain. It is the new go-to instrument for my 3 year old who would insist on trying to move and operate my Fender Stratocaster. I had to repair the neck once, which was an easy glue+pressure fix. Small initial investment makes it a really awesome piece. If only it would stay in tune. Some friends got me one of these from Hawaii and I quite like it. It’s better than my Mahalo except for the finish which is quite rough (drips, tool marks etc) but it sounds great and intonation and tuners are OK.
My grandson got one of these Universal Hawaiin Ukes as a gift. 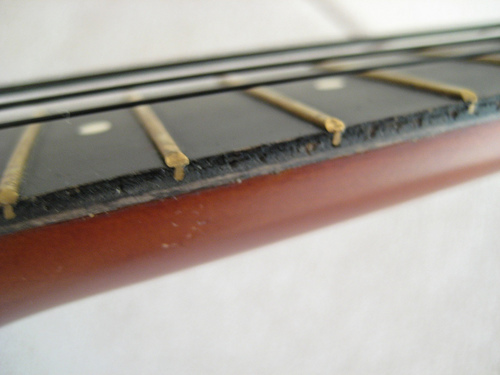 The string tightening pegs would not hold – the strings loosened immediately. Upon tightening the strings, the string holder on the the sound box immediately ripped off. It was secured with but 3 tiny screws. This Uke, and I assume all of them marketed by Universal Worldwide, are JUNK!! They should not allowed to be sold. Typical of the garbage and poor quality of imports from China. I had a Uke in grade school in the 50s and it lasted for 3 decades, tuned easily, never broke, was made in the USA. Again, this JUNK should not be sold or bought. It is so disappointing to encounter this sort of thing again and again. I bought my U.W.T. 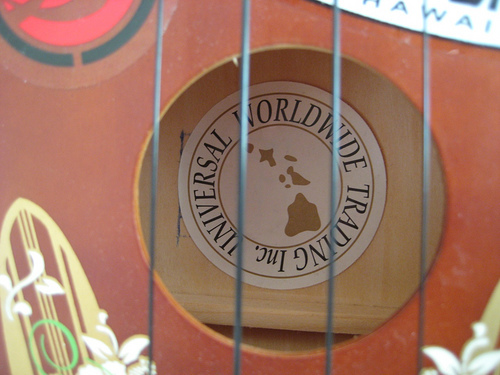 Inc. ukuele about five years ago (2009) in the isles of Hawaii. I think it cost less than $20 in an ABC store (or similar). Recently began playing I more seriously. Bought some $7 strings and changed those. Sounds a little richer. My opinion… For being a souvenir, it’s highly playable and worth every cent. It’s possible some of the chords could sound better on a better uku (b-flat as an example) is muffled and maybe a more expensive uku would allow it to sound more similar to the very well known C.
I also bought Ukulele for Dummies. It’s also easy to use and fun to learn with. I do play drums, so I already have some musical understanding (what I lack, I research and learn free on the internets). it’s a simple string instrument to learn and play effectively. For about $30 investment (don’t be turbo and change the strings and it’s still fine) it’s worth every penny. Heck, at twice the price it’s still worth it. If you need some uku motivation, search for Stefaan Raab and Will Smith on YouTube. Classic uku fun! And if your pegs won’t hold their friction… Purchase a little rosin (violin bow, for example) and mix it with some rubbing alcohol (it will take a min and stirring to mix together, or just be lazy and wait fifteen minutes or so), use a q-tip to get it on the pegs. Bam! Friction and better tuning. I have one from the ABC store. Mine was 30 dollars and the worst 30 dollars ever spent. C-note does not work and is unable to tune. I realized this right as I was leaving Hawaii. Never again.